Although, as critic Ivor Brown has noted, ‘‘there was far more in Doyle’s literary life than the invention of his fascinating and volatile detective,’’ it is as the creator of Sherlock Holmes that Sir Arthur Conan Doyle is remembered. The volumes of historical analysis for which he was knighted have been virtually forgotten; his extensively researched historical novels have not endured. Likewise, his other stories and novels, including some works of early science fiction, are largely overshadowed by the exploits of Holmes, the world’s first consulting detective and one of the most famous literary creations of all time. An Aspiring Doctor. Arthur Conan Doyle was born in Edinburgh, Scotland on May 22, 1859, into an Irish Roman Catholic family of noted artistic achievement. After attending Stonyhurst College in Lancashire, he entered Edinburgh University as a medical student in 1876. One of his mentors at Edinburgh was Dr. Joseph Bell, who would later serve Doyle as the model for his detective Sherlock Holmes. Doyle received a doctor of medicine degree in 1885. In his spare time, however, he began to write stories. Doyle grew up in a time known as the Victorian era, during which Queen Victoria ruled England and its territories (including Scotland). Queen Victoria sat on the throne longer than any other British monarch, from 1837 until 1901. This period saw significant changes for both Britain and Europe as a whole, with industrialization leading much of the population to jobs in factories instead of on farms as in the past. The era also saw advances in the sciences and scientific thinking, reflected in Doyle’s detective fiction. Early Writing and the Birth of Holmes. After two long sea voyages as a ship’s doctor, Doyle practiced medicine at Southsea, England, from 1882 to 1890. In 1885 he married Louise Hawkins and in March 1891 moved his young family to London, where he began to specialize in ophthalmology. His practice remained small, however, and since one of his anonymous stories—a hoax about the real-life ‘‘ghost ship’’ Marie Celeste called ‘‘Habakuk Jephson’s Statement’’—had enjoyed considerable success when it appeared in the Cornhill Magazine in 1884, he began to devote himself seriously to writing. The result was his first novel, A Study in Scarlet, which introduced the detective Sherlock Holmes to the reading public in Beeton’s Christmas Annual for 1887. This was followed by two historical novels in the tradition of Sir Walter Scott, Micah Clarke in 1889 and The White Company in 1891. The immediate and prolonged success of these works led Doyle to abandon medicine and launch his career as a man of letters. The second Sherlock Holmes novel, The Sign of the Four (1890), was followed by the first Holmes short story, ‘‘A Scandal in Bohemia’’ (1891). The instant popularity of these tales made others like them a regular monthly feature of the Strand Magazine, and the famous Adventures of Sherlock Holmes series was begun. In subsequent stories Doyle developed Holmes into a highly individualized and eccentric character, together with his companion, Dr. Watson, the narrator of the stories, and the pair came to be readily accepted as living persons by readers in England and America. In addition to his popularity among the reading public, Holmes’s use of scientific techniques in solving crimes both echoed and helped popularize forensic science, particularly finger printing which was in its infancy in the nineteenth century. Further, Holmes’s use of observation and deduction paralleled some of the important discoveries of nineteenth-century science, such as Charles Darwin published in The Origin of the Species and William Smith in the Geological Map of England and Wales and Scotland. But Doyle seems to have considered these stories a distraction from his more serious writing, eventually grew tired of them, and in ‘‘The Final Problem,’’ published in December 1893, plunged Holmes and his archenemy, Dr. Moriarty, to their apparent deaths in the falls of Reichenbach. Nine years later, however, he published a third Sherlock Holmes novel, The Hound of the Baskervilles, but dated the action before Holmes’s ‘‘death.’’ Then, in October 1903, Holmes effected his mysterious resurrection in ‘‘The Empty House’’ and thereafter appeared intermittently until 1927, three years before Doyle’s own death. All told, Doyle wrote fifty-six Sherlock Holmes stories and four novels (The Valley of Fear, 1914, was the last). Other Literary Aspirations. Among the other works published early in his career, which Doyle felt were more representative of his true artistry, were Beyond the City (1892), a short novel of contemporary urban life; The Great Shadow (1892), a historical novel of the Napoleonic period; The Refugees (1893), a historical novel about French Huguenots; and The Stark Munro Letters (1894), an autobiographical novel. In 1896 he issued one of his best-known historical novels, Rodney Stone, which was followed by another historical novel, Uncle Bernac (1897); a collection of poems, Songs of Action (1898); and two less popular novels, The Tragedy of Korosko (1898) and A Duet (1899). Nonfiction Work. After the outbreak of the Boer War, Doyle’s energy and patriotic zeal led him to serve as chief surgeon of a field hospital at Bloemfontein, South Africa, in 1900. His The Great Boer War (1900) was widely read and praised for its fairness to both sides. In 1902 he wrote a long pamphlet, The War in South Africa: Its Cause and Conduct, to defend the British action in South Africa against widespread criticism by pacifist groups. In August 1902 Doyle was knighted for his service to England. After being twice defeated, in 1900 and 1906, in a bid for a seat in Parliament, Sir Arthur published Sir Nigel (1906), a popular historical novel of the Middle Ages. The following year he married his second wife, Jean Leckie (his first wife having died of tuberculosis in 1906). Doyle now took up a number of political and humanitarian causes. In 1909 he wrote Divorce Law Reform, championing equal rights for women in British law, and The Crime of the Congo, attacking the exploitation of that colony by Belgium. In 1911 he published a second collection of poems, Songs of the Road, and in 1912 began a series of science fiction stories with the novel The Lost World, featuring another of his famous characters, Professor Challenger. Spiritualism. Doyle had been interested in spiritualism since he rejected his Roman Catholic faith in 1880. In 1915 he apparently experienced a ‘‘conversion’’ to ‘‘psychic religion,’’ so that after the war he devoted the rest of his life and career to propagating his new faith in a series of works: The New Revelation (1918), The Vital Message (1919), The Wanderings of a Spiritualist (1921), and History of Spiritualism (1926). From 1917 to 1925 he lectured on spiritualism throughout Europe, Australia, the United States, and Canada. The same cause led him to South Africa in 1928 and brought him home from Sweden exhausted, in 1929. He died on July 6, 1930, of a heart attack, at his home in Crow-borough, Sussex. Queen Victoria (1819-1901): The longest-reigning British monarch (sixty-three years), she gave her name to the age. Her ''hands off'' approach to rule allowed a succession of dynamic prime ministers to chart an imperialist course for Britain. Brigham Young (1801-1877): First governor of Utah and president of the Church of Jesus Christ of Latter-day Saints from 1847 to his death. Called the ''American Moses'' by his followers for leading them through the desert to the ''promised land'' near the Great Salt Lake. Thomas Hardy (1840-1928): English novelist whose work explored the psychological depth of characters whose lives were nonetheless determined by societal forces outside their control. Oliver Wendell Homes (1808-1894): Popular American poet, novelist, doctor, lecturer, and wit, he dominated the intellectual life of New England for much of the nineteenth century. Ivanhoe (1819), a novel by Sir Walter Scott. Considered the first great historical novel, this book, set in twelfth- century England, single-handedly kicked off a medieval revival craze that would influence English art, literature, and architecture for decades to come. ''The Purloined Letter'' (1844), a short story by Edgar Allan Poe. This short story is often considered the first detective story, or as Poe called them, ''tales of ratiocination." Detective Fiction. Although the Sherlock Holmes stories quickly became the definitive detective stories of their age, they were not the first. That honor is often accorded to Edgar Allan Poe, who wrote several stories featuring the fictional detective C. Auguste Dupin. Charles Dickens also dipped his quill into detective mysteries with his novel Bleak House, and his protege Wilkie Collins is often called the ‘‘grandfather of detective fiction.’’ Collins’s novel The Moonstone (1868) is considered by some to be the greatest piece of detective fiction ever written. Detective fiction has often been categorized as pure entertainment. In recent decades, criticism has begun to shift toward a more serious consideration of these tales. Doyle’s detective stories are seen as fascinating clues to the culture in which they were written and as explorations of the attitudes characteristic of late-Victorian life. Influence. In addition to the inestimable influence his Holmes stories have had, Doyle’s Lost World has spawned several cinematic adaptations, some overt, some, such as King Kong and Jurassic Park, mere homages. His Professor Challenger stories anticipated later magic realist and neo-realist efforts to blend rigorous scientific observation with fantastic events and landscapes. Most early book reviewers had favorable opinions of The Adventures of Sherlock Holmes. Typical is the judgment voiced by one anonymous critic in a British periodical, The Athenaeum, who said of the collection, ‘‘Of its kind it is excellent; there is little literary pretension about it, and there is hardly any waste of time about subtle characterdrawing; but incident succeeds incident with the most businesslike rapidity, and the unexpected always occurs with appropriate regularity.’’ Another reviewer, William Morton Payne, singled out ‘‘The Red-Headed League’’ for particular note in an American journal, The Dial, remarking that the story ‘‘is a striking illustration of the author’s originality.’’ Years later, Doyle cited the same reason for ranking ‘‘The Red-Headed League’’ as his second favorite Holmes story (with ‘‘The Speckled Band’’ first). In 1959, a poll among readers of the Baker Street Journal, a magazine for Sherlock Holmes fans, concurred with Doyle. Sherlockian Opinions. The largest body of criticism on the Sherlock Holmes stories comes from groups of enthusiasts who call themselves ‘‘Sherlockians’’ or ‘‘Holmesians.’’ In over fifty journals and newsletters published worldwide, the most prominent being the American Baker Street Journal and British Sherlock Holmes Journal, writers attempt to resolve inconsistencies in the stories or deduce aspects of Holmes’s and Watson’s lives from clues given in the stories. The central premise shared by these writers, from which much of the fun of their essays arises, is that Holmes was an actual person who solved real mysteries. Such articles must obviously be read from the same tongue-in-cheek perspective in which they were written. However, they often provide worthwhile information on the historical background of Doyle’s stories and testify to the mystique Sherlock Holmes still holds today. One of the best examples of criticism in this ‘‘Sherlockian’’ vein is Gordon L. Iseminger’s essay on Holmes as a Victorian archetype, since it demonstrates ways in which Holmes was a product of the culture from which he emerged. Growing attention to both popular fiction as a category and Doyle as a writer has led critics and readers alike to reexamine Doyle’s other writing, such as his science fiction and historical novels. This nearly forgotten body of work is proving to be of interest in its own right, along with its value in illuminating relationships between different types of popular fiction and parallels to the immortal Holmes stories. 1. Criminology was a field in its infancy when Doyle wrote his Holmes stories. Using your library and the Internet, research some of the techniques used by police to catch criminals in the nineteenth century, twentieth century, and today. Write a paper covering developments in forensics since the mid-nineteenth century. 2. The characters Sherlock Homes and Dr. Watson came to be accepted as real by many readers at the time they were first published, and contemporary enthusiasts continue to treat the characters as if they were real, using details in the stories to infer further aspects of the personalities of Holmes and Watson. As you read the stories, notice the eccentricities of character and specific details of characterization that have made readers view the detective and his aide as historic figures. 3. Sherlock Holmes was a quintessentially British character, yet he was as popular in America as in England. Research cultural factors in turn-of-the-century America that could account for the popularity. You might also consider other factors that might have made Holmes appeal to Americans that wouldn’t necessarily have appealed to British readers. 4. The Sherlock Holmes stories reflected the late Victorian culture in which they were written. The stories present the daily life, social mores, and class concerns of Victorian England. Use your library and the Web to research the social and sexual conventions for which the Victorians were known. How are these conventions different from those of contemporary society? 5. Research the principles of logic known as induction and deduction. Distinguish between them, and identify the elements of each demonstrated by Sherlock Holmes’s reasoning in a Holmes story of your choice. You might wish to judge which principle predominates in Holmes’s thinking, or which most aids Holmes in solving the mystery. Then write a report calling attention to use of induction and deduction in the Holmes story you have chosen. 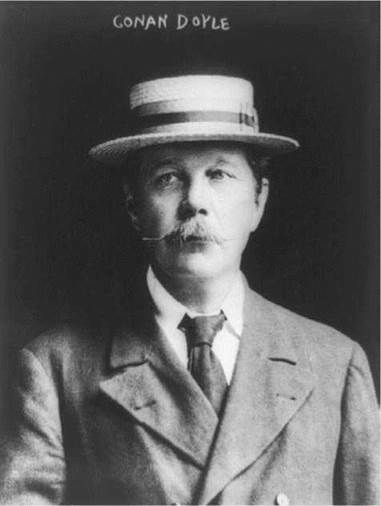 Cox, Don R. Arthur Conan Doyle. New York: Ungar Publishing, 1985. Orel, Harold, ed. Critical Essays on Sir Arthur Conan Doyle. New York: MacMillan, 1992. Rodin, Alvin E., and Jack D. Key. The Medical Casebook of Dr. Arthur Conan Doyle: From Practitioner to Sherlock Holmes and Beyond. Melbourne, Fla.: Krieger Publishing, 1984. Anderson, Roger. ‘‘What Sherlock Holmes Knew and How He Knew It.’’ Baker Street Journal 48.2 (1998): 9-18. Fisher, Benjamin F. ‘‘The Hound of the Baskervilles 100 Years After: A Review Essay.’’ English Literature in Transition 1880-1920. 47.2 (2004): 181. The Official Web Site of the Sir Arthur Conan Doyle Literary Estate. Accessed February 15, 2008, from http:www.sherlockholmesonline.org. Last updated in 2000. Sherman, Michael J. 221bakerstreet.org. Accessed February 15, 2008, from http://www.221baker street.org. Last updated on November 6, 2001.